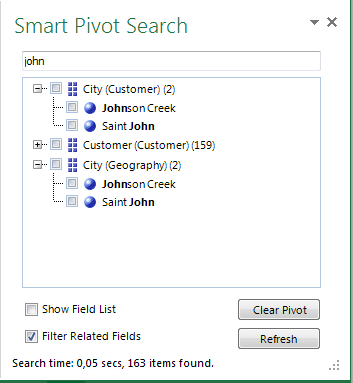 A much requested feature now available (should have been in the initial Search release honestly…): SmartSearch pane now allows for measure group/table filtering, much like the regular PivotTable fields browser in Excel. 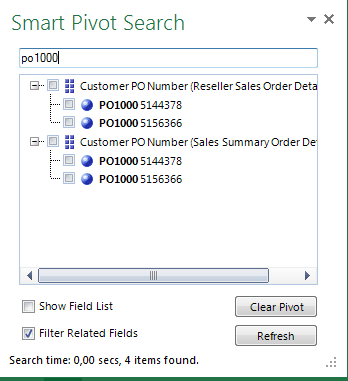 Download the new SmartPivot release here. You can now share your charts session, opening it in a browser or tablet/mobile window (disclaimer:some safari/OS issues still to fix). You can then collaborate real time with anyone connected to that SmartCharts session. 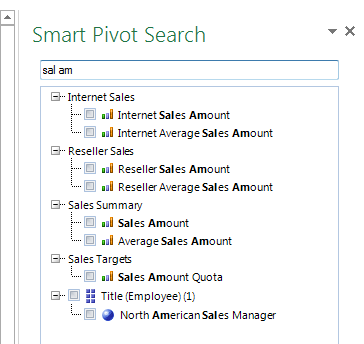 Also, you can freely download SmartCharts Task Pane in Office Store during #SPC2014. :) feedback will be appreciated! Soon to be published SmartCharts for SharePoint ;) stay tuned. Following a previous post (“Multi-threading” the Sql Server Analysis Services Formula Engine – I #ssas #mdx ), we returned recently to the issue of multi threading and SSAS formula engine. See that last post or this post by James Serra for reference. 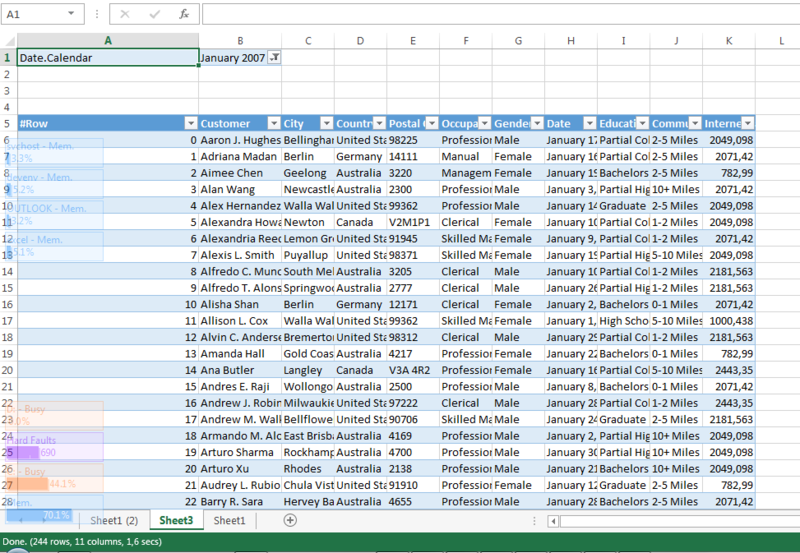 Sample query generated by PerformancePoint (a scorecard model, kpis on rows), running in 50-60 secs. 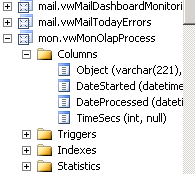 To return a complex and FE intensive scorecard with several different KPIs (completely different measure groups), with values/metrics like value, ytd value, prior year, end of year projection, target, ytd target, score and so on… well, requires a not so usual amount of computation by SSAS. Worst, due to the, let’s call it a “reasonable”, :) amount of mdx scopes involved it triggered some internal thresholds i, and it stops being smart… maybe switching to cell by cell mode? 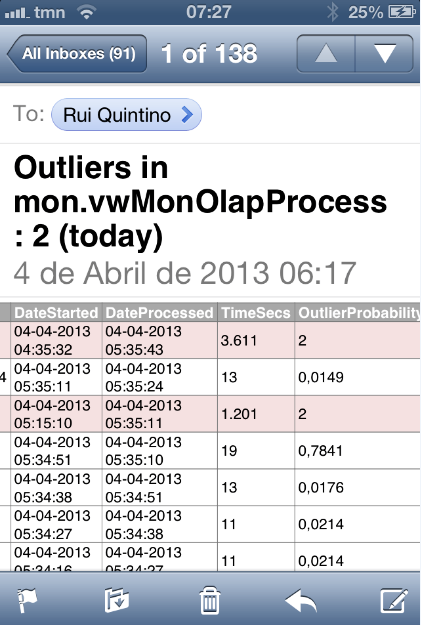 Query 3 kpis individually, none exceeds 2-3 secs, get the 3 together in the same query, –> 30-40 secs…. After exhausting all the tuning we could possibly remember… reducing down the query from 1m20 secs, to under 40-50 secs, but still annoying, why all the CPU power if we are waiting for damn 50 secs? Short story, how it works? But if this post happens to generate some requests where it can be put to good use I consider to share it privately or even on our codeplex sample site. Please be warned that in most cases you won’t need anything like this, SSAS FE engine should work just fine because it’s very smart (and we are not! :) ), only for very complex cubes and specific scenarios something as risky as this can be possibly useful. 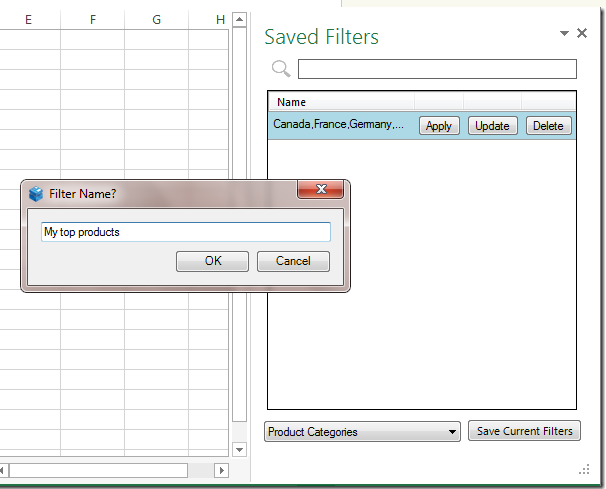 This feature allows saving filter selections on the pivot for later use on other pivots targeting identical hierarchies. The saved/quick filters are persisted locally in user profile configuration, so that you can always refer to them very quickly. Now just create any other connection to the same cube, and use the quick/saved filters to apply the exact same selection as before. Filter by list feature now works as a task pane (expect most of SmartPivot dialogs to be migrated to task panes as they allow for better usability). 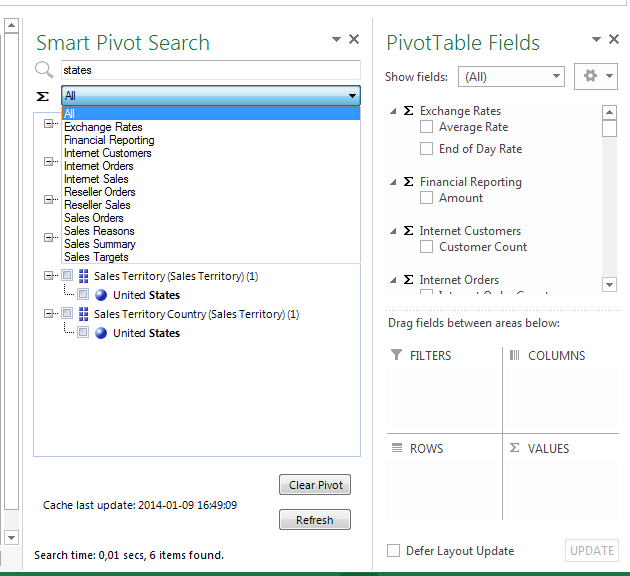 Download SmartPivot through the product page here. 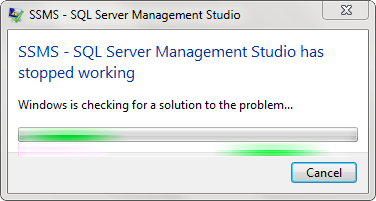 The never-ending thread… :) Anyway, I just finished some tests with Excel 2013, like the title says, good news, and bad news. (that is, imo). So, bad news first, so that I can finish this post in a good mood! Not that I was expecting improvements here, but it’s sad to note that for now I get the same very bad experience both with 2010 & 2013. 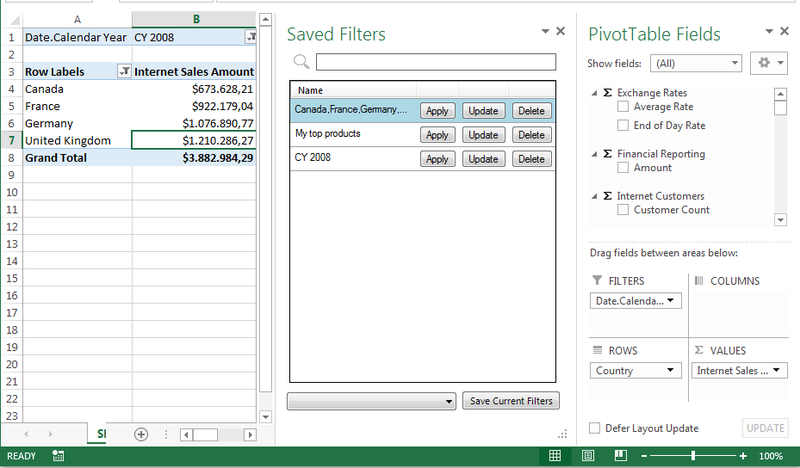 Fortunately, I was glad to see that SmartPivot tabular report works perfectly on Excel 2013 Preview. Same 244 rows in a native table, 11 columns, ~1.6 secs… No dumps. 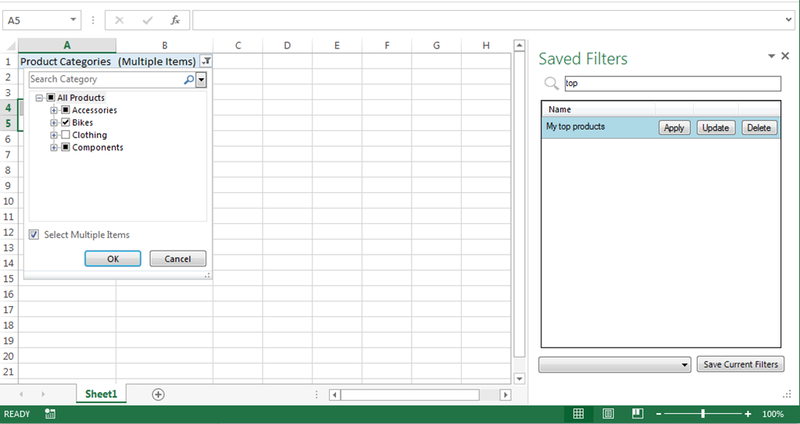 Good News-Edit Dax Query in Excel tables shows potential, but we’ll need a friendly query editor soon! If there’s one thing I always hoped that the tabular model could fix, (and as the tabular suggests… ), were real tabular queries, with real excel tables. A single semantic model (read *real* semantic, not bism…) to rule them all (both pivot and table queries). Yes, there’s more to data science than pivot tables and low grain aggregated values. 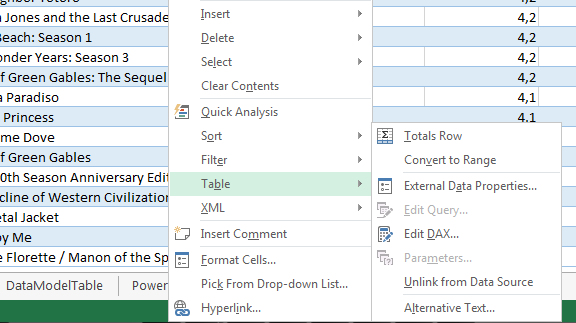 And although I don’t feel the problem is properly solved in the Excel 2013 preview, there’s a new table menu option that immediately caught my attention: Edit DAX. 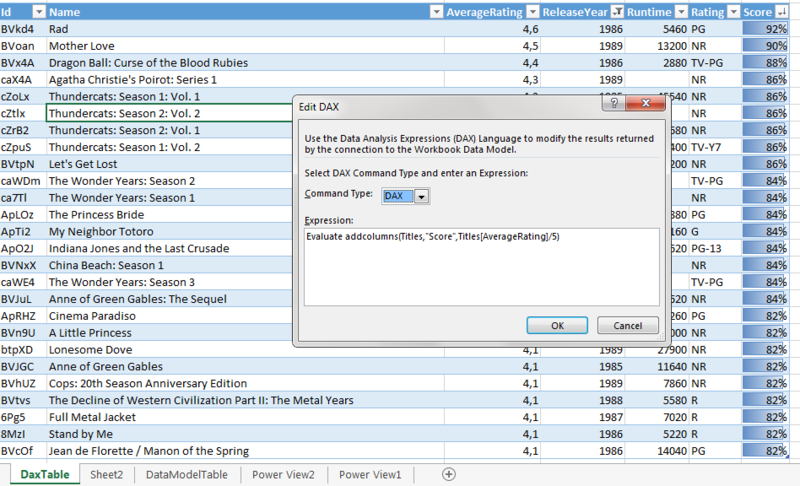 That will allow to edit the underlying DAX model query being used, switching from table style query to a full DAX query. I can only guess (hope!) 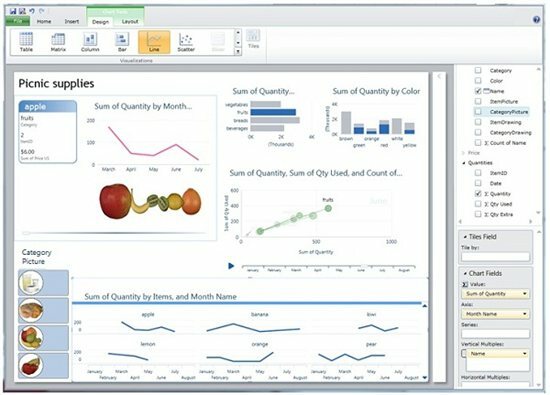 that anytime soon, the old field list/pivot layout that today supports most of pivot table/pivot chart data analysis will be finally replaced to a full grown olap/tabular friendly query editor, that can target lots of data layouts (pivot/table style). 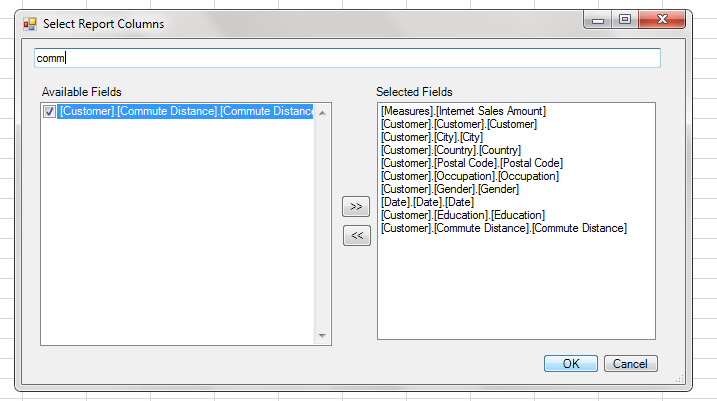 Like the field list in a pivot table, there should be a field list for a data model based table query. That would be pretty amazing. Because, and I’ll have to disagree with some msbi most valuable guys :), DAX (like MDX) is extremely difficult to craft manually beyond the basic stuff. For pivot based layouts we can live (hardly…) with the drag & drop field list. 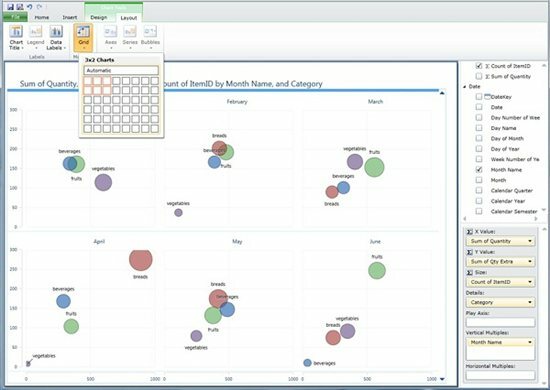 For tabular queries (particularly for DAX queries) users will need a new (very easy & very visual) query editor tool that explores the full potential of tabular backends. That reminds me that although I can’t say that DAX is a lot more complex that MDX (I’m tempted to…:) ), or the way way around, one thing is for sure, Excel OLAP users never needed to know MDX to work with OLAP, I and hope that they’ll be able to get the full power of tabular without knowing DAX too! 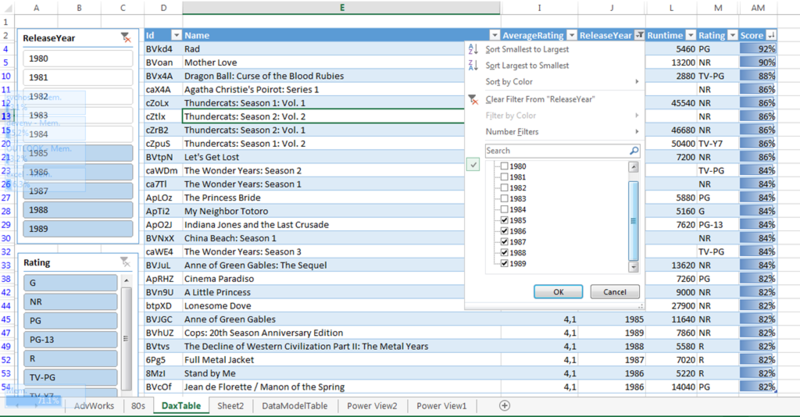 Final note – Slicers also work with DAX query tables, but they use visual filtering in the Excel table. No, you won’t find another deep review of “denali” here. :) No time for that, there’s so much to explore. But I’ve been reviewing several posts, so I leave you with my top posts & notes so far. 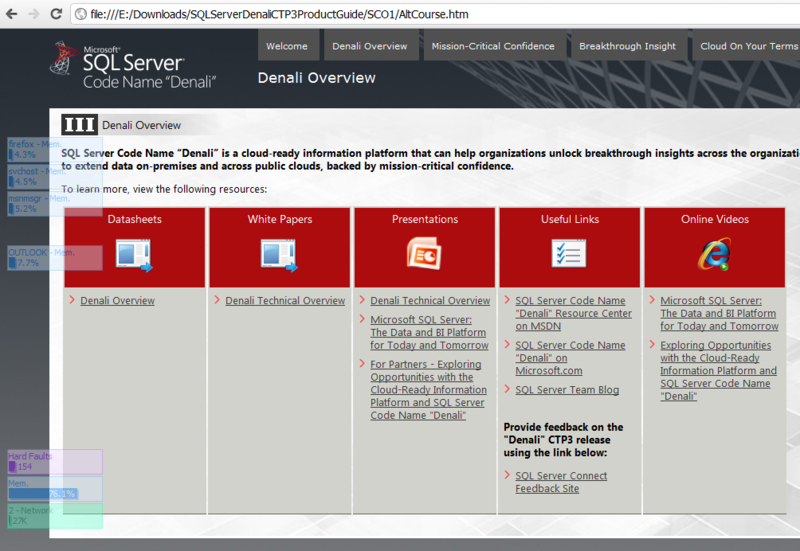 Download SQL Server “Denali” CTP 3 here. Data Visualization > Tabular Model, Columnstore, new BIDS released! 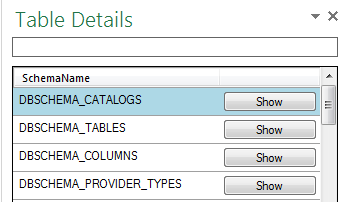 Hope that’s not for rtm… Does this mean no excel on tabular models direct mode??? Will Excel support DAX directly? 2010? 2012? Promising… finally! Note that its driven by data feeds… so we’ve got great potential here. Alerting is a new capability that we are adding to Reporting Services. 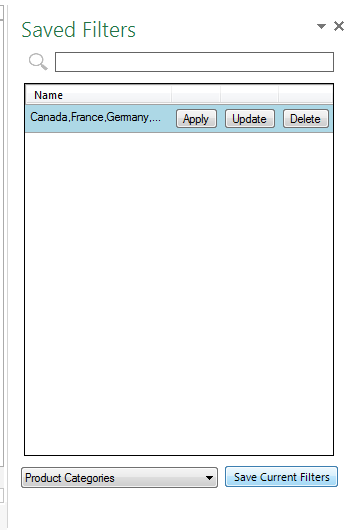 As soon as the report server is upgraded to Microsoft SQL Server Code Name “Denali”, it will enable any user that can access reports previously built with SSRS 2005, SSRS 2008 or SSRS 2008 R2 whether in Report Builder or BIDS, to setup alert rules and be alerted when report data changes occur that match a set of rules. No changes are required to the existing reports. You’ll need to have SSRS integrated with SharePoint in order to take advantage of this new capability (the reports must also use stored credentials data sources, similar to subscriptions). Management of alerts is also enabled through SharePoint through a common interface. 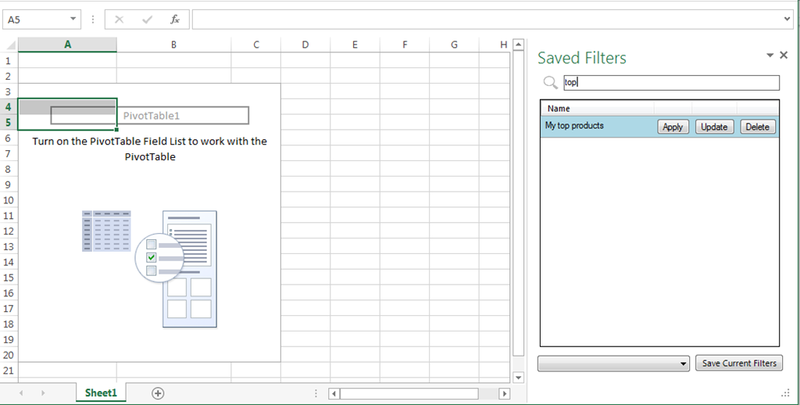 A PowerPivot file (XLSX) in a PowerPivot Gallery in SharePoint Server 2010. 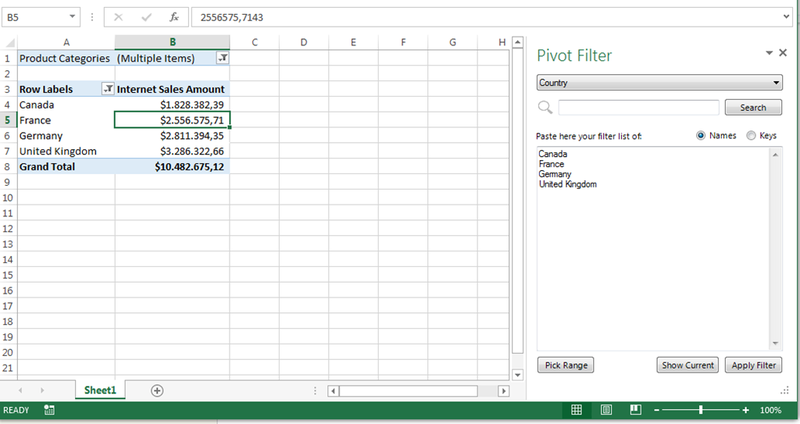 For more information, see Use PowerPivot Gallery. 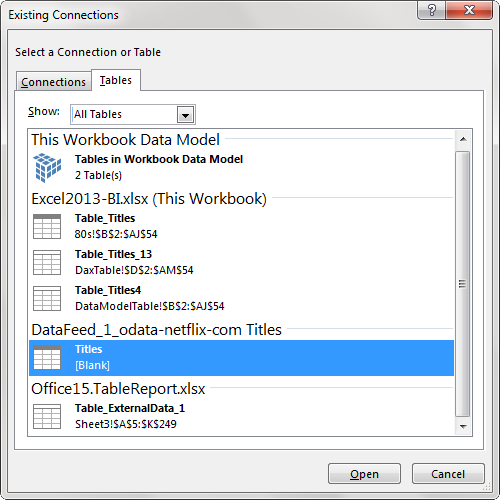 A shared data source (RSDS) with a Microsoft Business Intelligence Semantic Model data source type, based either on a PowerPivot file on a tabular model on a Analysis Services server. 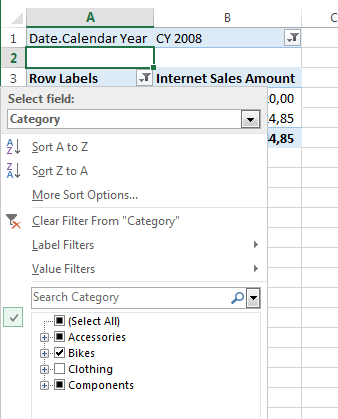 For more information, see Tabular Model Connection Type (SSRS). – And yes, I’ve got a feeling and for now I’m agreeing with Andrei Pandre , and sorry Andrew I have to disagree, I can’t easily spot a proper BISM (semantic model)(cof, yes, apart from the .bism extension…) that unifies & shields client apis from tabular or typical olap models. I see two models, with some clients (excel) being forced to see a tabular model as an olap model, and others seeing only a tabular model (crescent) … kind of “messy” … Hope it will be better! The old report models seem much more semantic to me….